« . link love 7/12 . Lemon-blueberry is such an underrated flavor combination – but it’s one of the few that I’ll sometimes choose over chocolate. 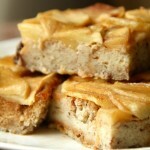 I love baking with Greek yogurt, and these look incredible. Excellent photos! Thanks Ellen! It’s one of the few things I’ll choose over chocolate as well. Your pictures… so beautiful! These are the kind of muffins I want to wake up to. Spread with a little butter, a side of coffee, and I am in breakfast heaven! Lemon blueberry sounds like heaven. Blueberry muffins will always be my favorite! Lol at “moist.” I keep having to watch myself not to slip it in there since so many people aren’t fans of the word. I figure “soft and tender” get the point across too. Eeeeeeek these look beyond amazing 😯 . 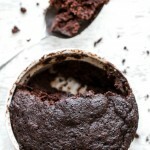 You can usually tell how good a muffin is going to be my its juicyness (and I actually cringed writing that words because it seems kinda explicit) and these take the cake! errr. muffin? And I have to admit, I don’t see what you see in jellybeans. They’ve always been that food for me where I think I’ll like it, have one, and then be set for another few months until I repeat the cycle haha. It’s like you’ve read my mind and know what my most recent indulgences have been. Loving all things blueberries and muffins recently! Lemon blueberry is an awesome summer combination! I definitely also have a major sweet tooth but I actually tend to go for berry and vanilla more than chocolate so these are perfect for me! This post couldn’t have come at a better time! I was planning on making blueberry lemon muffins today to send to my brother – perfect! It’s fate I hope you [and your brother] like them, Morgan! Blueberries have got to be my favorite berries as well! Even though just like you, I prefer chocolate over all of the things, it is nice to have a change of pace every once in a while. 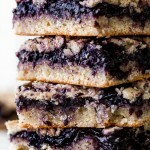 I have to give your other recipe a try though, blueberries, coconut sugar, and lemon juice sounds so divine! A perfect lazy person’s snack ;)! A few days ago, I declared I wanted to make healthy muffins with ingredients I already had on hand – greek yogurt, oats, banana, etc. I said, “I bet Amanda has a recipe!” AND YOU DID. The only gummy candies I like are jelly beans and sour watermelons. Swedish fish I can do, but I don’t know… I’m more of a chocolate person. It has to be DARK chocolate, though. Damn, I am picky. Hahah! I wanted to make blueberry muffins today! How ironic and perfect! That’s hilarious because sour watermelons are my other favourite gummy candy as well 😛 Then again, I got the biggest craving for fuzzy peaches today, but couldn’t find any in the store. Sad face. Stunning photos Amanda!! So I’m the opposite- I way prefer chocolate bars over gummy sweets but in baked goods? Fruity ones win hands down! Blueberries are my fave berry too, although tough call between them and strawberries! Will definitely try drizzling over lemon juice next time :-)! I am usually all about chocolate for my desserts, but I have such a weak spot for anything blueberry, zucchini, carrot, or ginger. Blueberries are the best in muffins! I love lemon muffins but have never made my own. 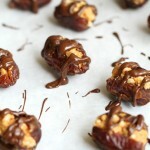 As soon as its cool enough in my house to turn on the oven, I’ll make these! Hehe. I honestly didn’t know whether or not I should post a baking recipe in the dead of summer. It’s like… are there other people out there besides me who are crazy enough to turn on their oven when it’s +30 outside?! This is one of my favorite flavor combinations, and the only way I will eat blueberries! If blueberries are not in muffins, they are not my thing. Thankfully, that won’t be an issue with such a refreshing recipe such as this. 🙂 Thanks Amanda! Lemon and blueberry…I need to redo that combo as I tried a scone the other day and didn’t mind it. Truth be told, it was also covered in a glaze but still! Hi Amanda! I’ve never baked with Greek yogurt before and clearly should give it a try. I do agree the the blueberry/lemon combo is amazing. Delicious recipe! You should definitely give it a try in baking, Ashley! It’s one of my favourite ingredients to use when I’m tying to make things a little healthier. Love lemon and blueberry together! And I love muffins. And Greek yogurt. So…I guess I’m making these 🙂 Fantastic photos, too! They make me want to bite right into my screen! I just bought a big box of blueberries from Trader Joe’s this morning and I cannot wait to dive into them tomorrow morning. I am chocolate all the way…I actually can’t remember the last time I had a gummy bear or worm or anything gummy…LOL! You had me drooling at the first photo! These look fantastic! We Grow a lot of the nations blueberries in New Jersey. I love the taste of fresh blueberries. Lemon muffins are also one of my favorite combos do I’m all about this combo LOL. Blueberry and lemon is HEAVEN. Lovely photos! Those juicy blueberries, mmhhmmm. How many eggs for the recipe?? Not shown on the ingredients list. Oops, it was 2 eggs. I didn’t even realize that I left them out of the ingredients, so thanks for bringing that to my attention, Nore! Yum! I actually had one of these for breakfast! I’m pretty sure yours are better than mine though. Yum! I think blueberry muffins might be one of my favorite foods…actually I am sure of it! I’m always looking for healthy alternatives to making them. I’ve experimented with GF, vegan, etc. but never with greek yogurt as a substitute for fat. What’s your favorite brand of Greek yogurt for this recipe? Would you have a guess about how would they turn out if I used all whole wheat pastry flour instead of ww and white? That should turn out fine, Cindy Lynn! Whole wheat pastry is actually one of my favourites to bake with. These muffins look to die for. It was blueberry muffin day on Saturday and I did not get to have one, so I need to fix that asap! I’m so obsessed with blueberries right now.! You know those big 2 pound containers? I’m averaging one of those every 5 days or so. Soooo good. So basically, blueberries with all the things. oh man that lemon-blueberry combo is absolute perfection, love that these are heavily studded with bloobs! Amanda – these look amazing! So good! I love blueberry muffins. I just baked some banana bread with Greek yogurt and every time I use it in baked goods I’m always so happy with how they turn out. I’d say strawberries are my favorite berry, but blueberries are a close second! Lemon and blueberry is like the perfect summer flavor combination. But strawberries and (coconut)cream are also good. But so are cherries and everything. Clearly I can’t pick. Ha! I sure am glad you are trying to expand your (tastebud) horizons – because – seriously – these muffins! Wow! And I would never have thought they were made with Greek yogurt had I seen them in a bakery case – they look phenomenal Amanda! Now I do have a question – when you say you don’t like chocolate ice cream…does that involve moose tracks too? Sweet mother of pearl LOOK at those blueberries just oozing. These look divine. Such a classic muffin flavour combination.. that I know these would have been delicious. 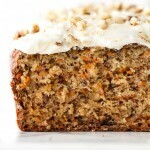 I love that you used greek yogurt too – it always makes baked goods so much more moist and tang-y. YUM. 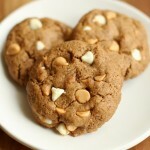 What would be the best way to make these GF? Or a go to flour to use instead of white flour and whole wheat? Because I have some blueberries and would love some muffins!!! Thank you! Sorry, Nicole! I don’t have a tonne of experience with making muffins with gluten-free flours, but I’ve heard that sorghum and brown rice work really well. Thank you for getting back to me! I decided I really wanted to try these muffins so I experimented. Instead of white flour I used all purpose gluten free flour, and for the whole wheat flour I chose coconut flour. I am not sure how the other muffins taste but these worked and were delicious. Thank you for the recipe! Hi Amanda! 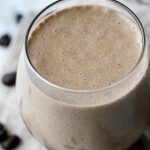 I was super excited to find this recipe because I was looking for a recipe that used lemons, blueberries, and Greek yogurt! I don’t know how your muffins turned out texture-wise, but mine came out chewy and dense 🙁 At first, I thought it was due to my expired baking powder, but even my second batch with non-expired baking powder came out super chewy and dense (but still tasted good!). I hand-mixed everything and was careful not to over-mix so I can’t figure out why they keep coming out like this. Do you have any advice?? Thanks! i was dissappointed in that too. That should work fine, Jane! Hey Amanda. What can I use instead of all-purpose flour? And can I use coconut yugort? What would you recommend for subbing the applesauce? 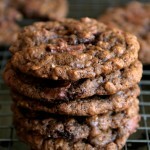 These look scrumptious and on the list for tomorrow’s baking. 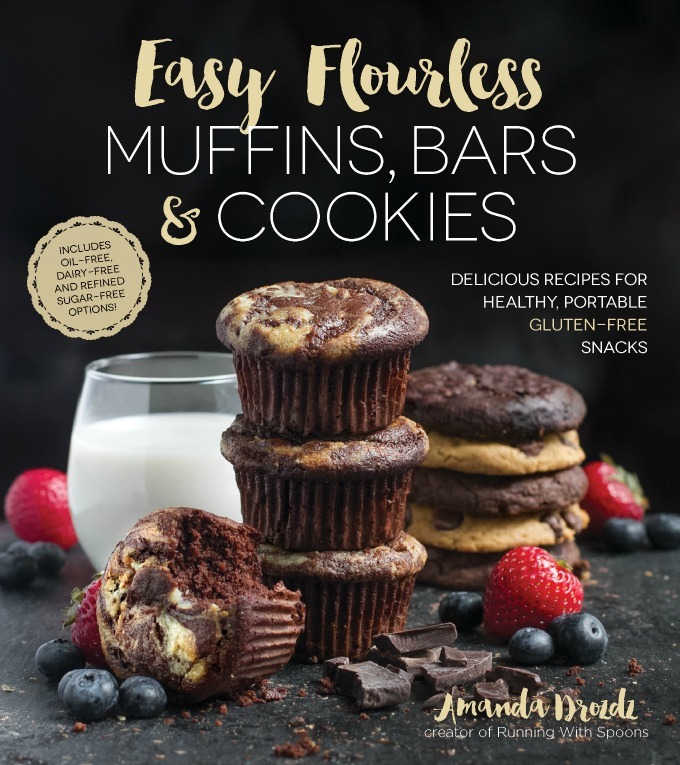 I have tried your blueberry oat greek yogurt muffins and loved them (shared with my principal and then he went and searched for your recipe and made himself a batch). Wanting to add lemon though. As for the jellybeans…I was an addict for many years and never NOT had them in my car, classroom (I am a school teacher), pantry, etc. When we switched to real foods, I had to give up my beloved Jelly Bellys! 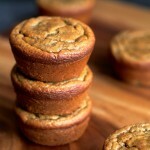 Just made these muffins and they are delicious!!! 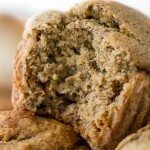 I’ve made muffins before with greek yogurt and love how moist they are. This recipe was much quicker than others I’ve used. LOVE it!!! Bookmarked the recipe. Will definitely make these muffins again. 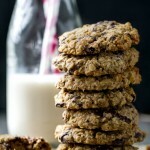 Do you have a recipe for oatmeal chocolate chip cookies?? Hello! I realize this comment is a bit late, but I was wondering how much I’d have to change the flour ratio if I used only all purpose flour instead of a mix. Or can I also use cake flour as well? It would just be a 1:1 ratio for all-purpose flour, so just use 1 1/2 cups of AP and you should be fine! 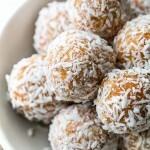 Just made these for a healthy on the go breakfast for the family. Of course, had to sample. So delicious! Good taste, however the texture was a bit gluey, and the centres fell after removing from the oven. I found that they stuck to the muffin papers, so I made a second set without papers. I did check with a toothpick to make sure that it came out clean.